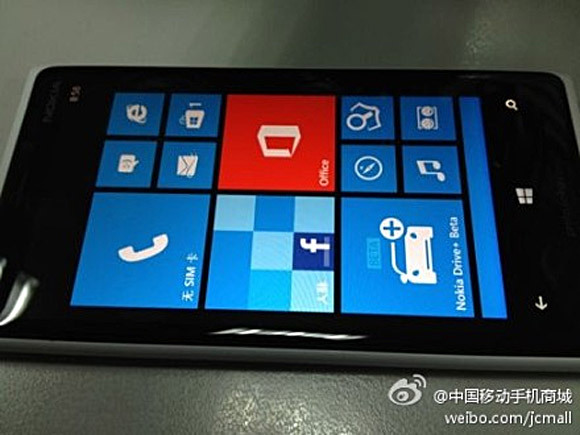 The Lumia 920, Nokia's flagship Windows Phone 8 handset, is coming to China Mobile (model number 920T). As it turns out the Lumia 920T has a Snapdragon MSM8960T S4 Pro chipset, unlike its international version, which has an MSM8960 S4 Plus chipset. The news comes from the carrier's Sina Weibo page. The difference is that the MSM8960T chipset features the Adreno 320 GPU and not the Adreno 225 like in the international and US Lumia 920 units. It still has two Krait CPU cores though, this isn't the S4 Pro chipset that's used in the Google Nexus 4. Still, getting an upgrade on the GPU is great even if you don't get double the CPU cores. The only problem is that most devs will be targeting Adreno 225 as that's what most WP8 phones out there have (Windows Phone handsets don't really have much of a variation in chipsets). It might have a lower power consumption as it won't be as burdened as the 225 using the same graphics. Could this Nokia Lumia 920T deal mean we'll start seeing Windows Phone 8 handsets with Adreno 320 or is it a one-off? If we do, WP8 will be able to put up a fight in the graphics department against the Android flagships and the iPhone. so pleased with my nokia lumina 320 had it a week and then screen cracked wont work not dropped or suffered any trauma is this a comon fault? If you drop a Nokia Phone, the floor doesn't break, windows does.